One of the vocal sports personalities in this country, Rashida Baaba Tandoh has indicated her admiration for Yaw Ampofo Ankrah considering his great contribution to the Media. According to the Staff of Multimedia Group Limited, Yaw Ampofo Ankrah has been of great help to her right from their working days at Metropolitan Television in Accra, and she is not surprised about his aptness and hard-work. 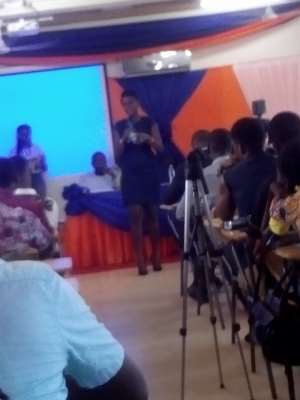 Baaba Tandoh made these revelations while speaking at a seminar organised by the Sports Writers’ Association of Ghana – GIJ Chapter to celebrate the life and exploits of Yaw Ampofo Ankrah in Ghana and beyond. Speaking at the session, Baaba Tandoh also informed participants to make good use of technology such as the internet to advance themselves in what they do since the world is fast changing. Talking about passion, the sports enthusiast entreated people to make good use of what they know, and can do better to change the world. She finally tasked everyone who attended the event to actively invest themselves in whatever they do so as to gain more recognition in the society. The one day seminar, themed “The Evolution” was held at the Ghana Institute of Journalism on Friday, 23 February, 2018, to celebrate the life of Yaw Ampofo Ankrah and his 20years contribution in the World of Sports. Yaw Ampofo Ankrah, who is currently with Kwese TV has gained a lot of experience from the Media by working with Sunshine Radio, TV3, Metro TV, Joy FM and SuperSport.